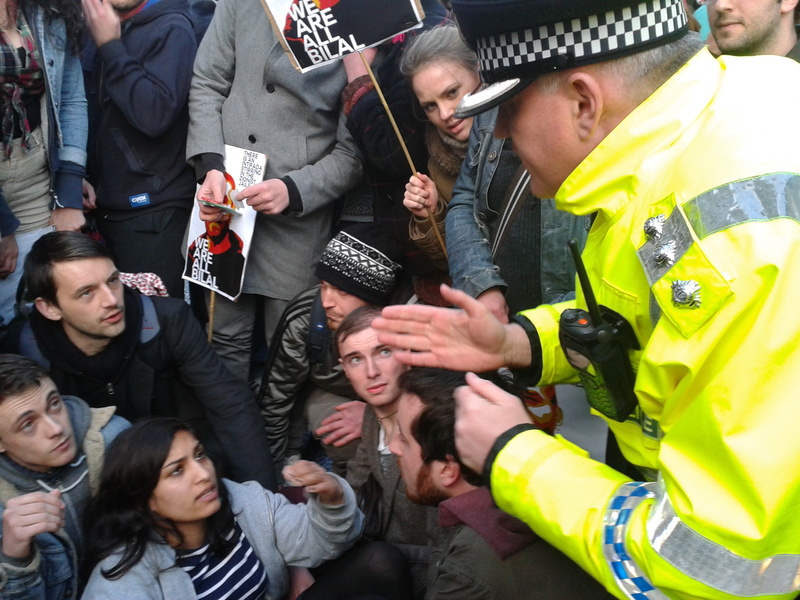 Strathclyde police lose the plot – defend the right to defend Palestine! 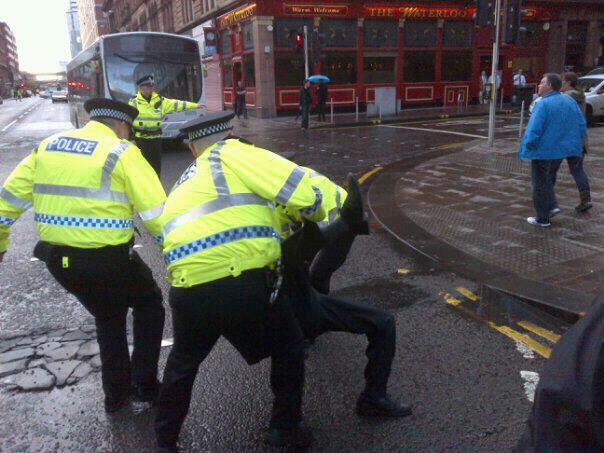 Strathclyde police officers violently attacked a peaceful protest in the centre of Glasgow on 17 April, using unjustified force to arrest one young man in chaotic scenes on Argyle Street at approximately 19:00. Another man, believed to be a bystander, was struck unconscious after having been attacked by police and had to receive medical treatment. 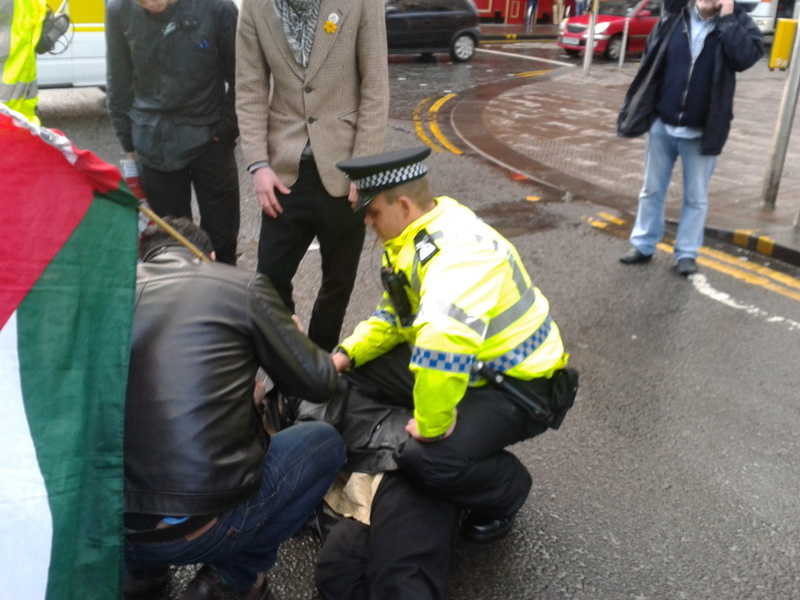 Further arrests were thwarted only by the actions of the crowd. The events took place during a peaceful protest in solidarity with thousands of Palestinian prisoners on hunger-strike, called by various progressive forces in Glasgow on Palestinian Prisoners Day. The Glasgow Defence Campaign is in the process of collating witness statements, photos and video footage of the day’s police violence; we have already received material and we urge all our supporters to send us any evidence whatsoever which may be useful for future defence work. Send material to glasgowdefence@yahoo.co.uk as soon as possible. This photo captures the moment officer A475 stamped on a man as he lay on the ground. The operation was directed under the command of Chief Inspector Fraser Lamb and we believe Inspector Derek Forsyth, with officers from Stewart Street police station. Glasgow Defence Campaign and Fight Racism! Fight Imperialism! supporters have gained much experience over the past year in dealing with such police misconduct and acted alongside other groups and individuals to ensure resistance to the police violence and arrests. While one comrade was arrested, protesters sat down and occupied the street for over 30 minutes, successfully defeating police attempts to huckle other targeted activists. We fully salute this resistance. In identifying the need to defend the right to protest in order to defend Palestine, we recently pointed out on this blog the need to hold the police publicly accountable for their abuses of power. Please sign our petition online. It is absolutely imperative that the lessons of the GDC are learned and implemented: namely, a political defence of all those criminalised for political activity and the need for the police and state prosecutors to be held publicly accountable. We must not allow the state to act with impunity in crushing dissent. 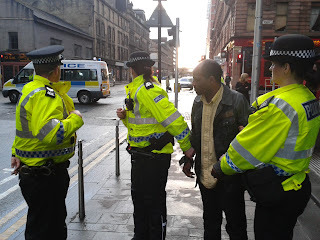 Since 2010, the GDC has documented police harassment of FRFI activists, student protestors, progressive football fans and Palestine solidarity campaigners amongst others. We call for the unity of all these forces on this important question. A petition can be signed here in defence of the right to protest. We send our solidarity to the comrade arrested and call for people to stand together and escalate action both in support of the Palestinian struggle and of those targeted by the police in this country for doing so. The next court picket called by the GDC is due to take place on Friday 27 April, 2pm at the Glasgow District Court on St. Andrews Street – all progressive forces must attend and make this a show of unity. Further video footage and photos of today’s violence will be uploaded on this blog in the coming days. Please share and distribute this statement online and elsewhere. Hi,my name is Mary Margaret McDowell,and I live in Greenville,SC.I just found your post on my news feed,and I am outraged that your peaceful protest,was so unfairly mishandled.Thank you so much for your efforts,and may God Bless and keep you safe. Think you want to change the line under the badge numbers to this>> >> I witnessed constable A455 clearly stamp on people who were sitting on the ground peacefully. Hope you all ok now?